Almost a year ago, Jaffa LA opened its doors on West 3rd Street in West Hollywood. 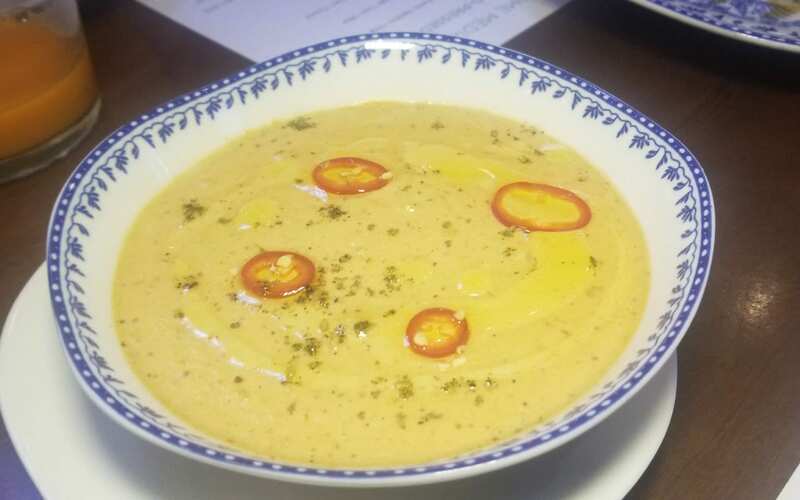 With a modern take on Israeli cuisine featuring fresh seasonal ingredients and sustainable meats and fish, Jaffa LA has been serving healthy, fresh and delicious flavors. 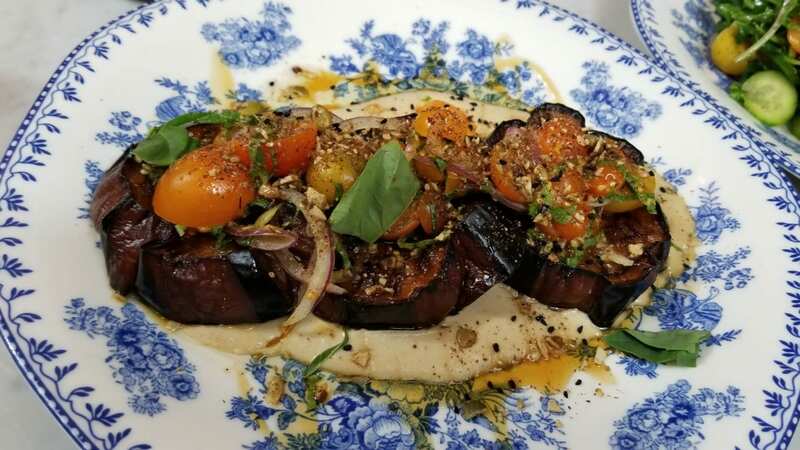 I returned this week to try a few new dishes and revisit some others and loved every single bite and that is why Jaffa LA is the Please The Palate pick of the week. There was not a bite that I did not enjoy. And now there are more reasons to head to Jaffa LA. One of the reasons is that Jaffa LA just launched Social Hour Bites, available weekdays from 4:00pm-7:00pm. On the Social Hour menu are four plates for $7-$9. 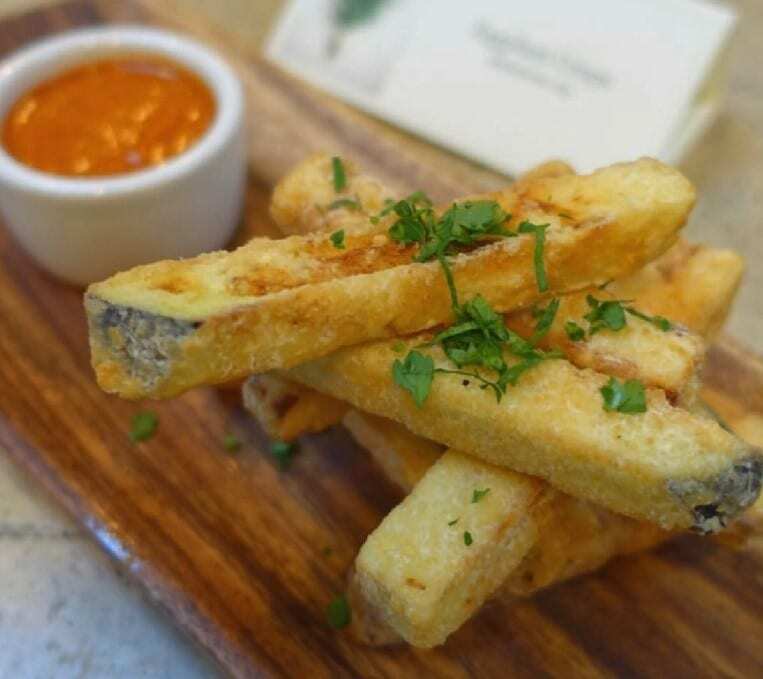 One of the most addictive items on the Social Hour list are the Eggplant Crisps with shakshuka dip. Crispy, warm, salted and gluten-free (for those who care), these can easily replace french fries. With some warm, house-made pita, it is fun to dip it in the Spicy Tahina, a spiced up version of the toasted sesame paste. 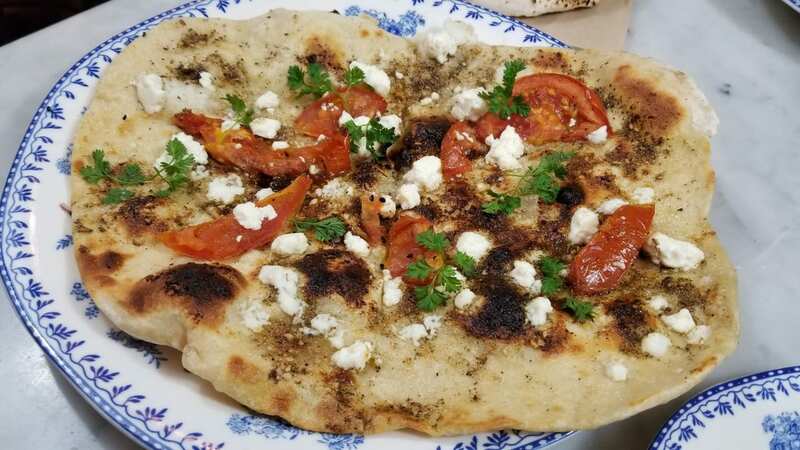 Instead of the typical happy hour pizza you might find elsewhere, try the Roasted Tomato & Feta Flatbread with zatar, garlic and EVO. 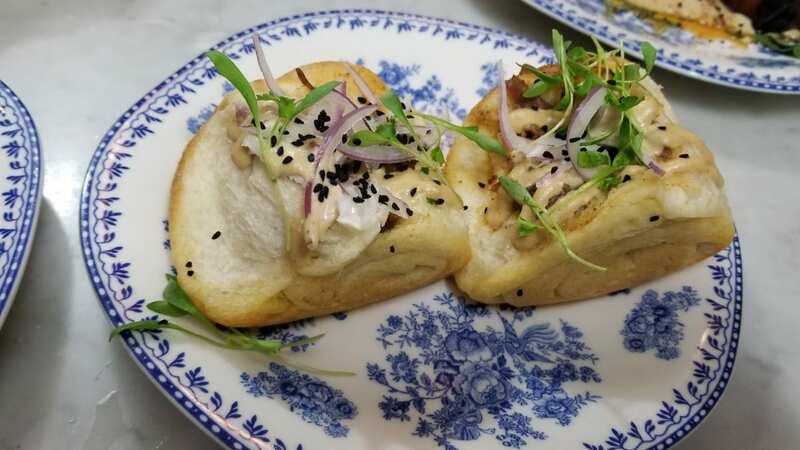 And if you are in the mood for a sandwich, try the Jaffa Lamb Sliders with Moroccan Spiced Lamb, Zhug, Tahina and Toum on the house-made Kubaneh (Yemenite pull-apart rolls). Also on the Social Hour menu are new Punch Bowls, perfect for parties of four or more. There is The Violet Hour (New Amsterdam Vodka, Creme de Violette, Lime, Prosecco), Group Therapy (Evan Williams Bourbon, Lemon, Mint Tea, Prosecco) or Winter Punch (Laird’s Brandy, Peach Liquor, Date Syrup, Prosecco). Jaffa LA has also created a menu of Cold Pressed Elixirs such as True Green (kale, spinach, cucumber, celery, parlsey, spirulina, ginger and green apple), Spicy Sangrita (cherry tomatoes, habaero, cara cara orange, lime and mint) and Jaffa Orange (tumeric, tangerine, carrot, mango, cucumber, lime and coconut). If you are heading to Jaffa LA during another time besides Social Hour, there are so many tasty options to choose from. 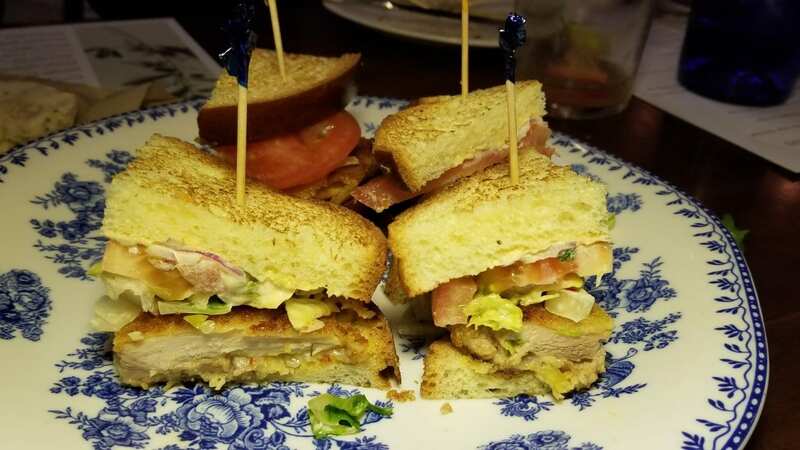 For lunch, try the Chicken Schnitzel Sandwich with harissa mayo and toasted brioche. 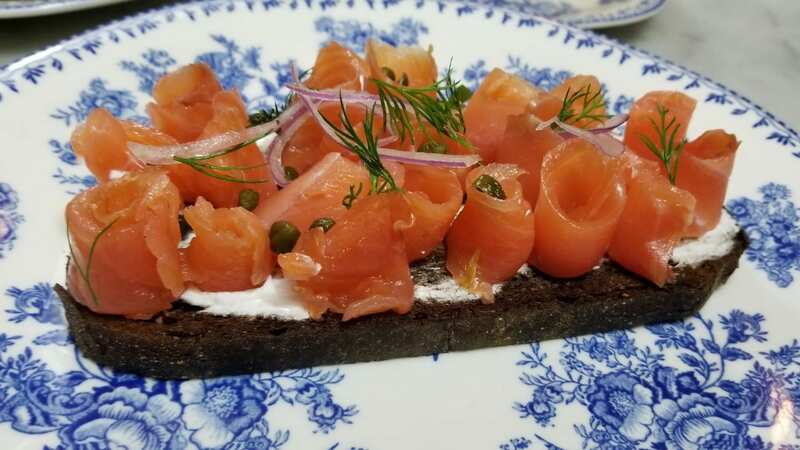 And for brunch, enjoy the Smoked Salmon Tartine with labneh and pumpernickel toast. 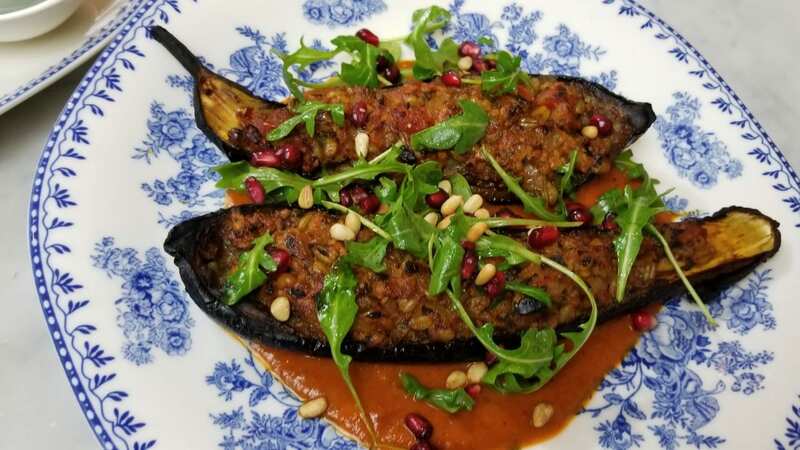 For dinner, the Stuffed Eggplant with lamb, freekah, tomatoes, chilis and pine nuts is the newest addition to the menu and it is a favorite. 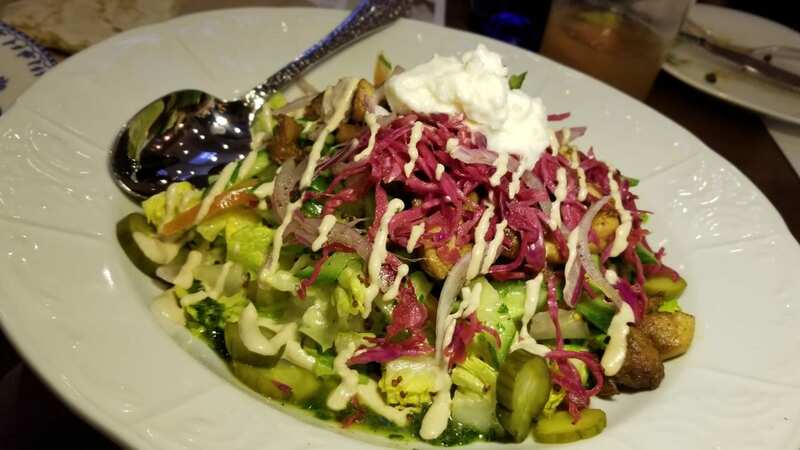 Or if you are in the mood for a salad for dinner, the flavorful Chicken Shawarma Bowl with Jidori chicken, Israeli salad, Israeli pickles, tahina, zhug and toum is a must. 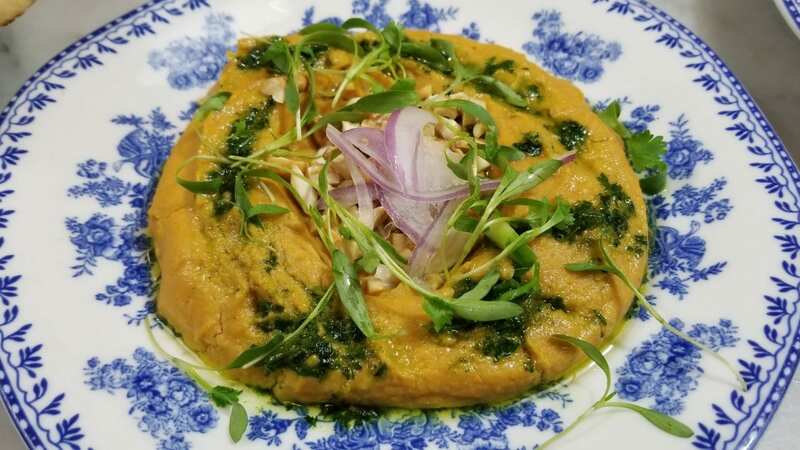 Whether it is for lunch for dinner, try the Sweet Potato Hummus with cashew cream, spicy zhug and cilantro. A play on a stuffed potato, the dish is creamy, sweet and addictive. 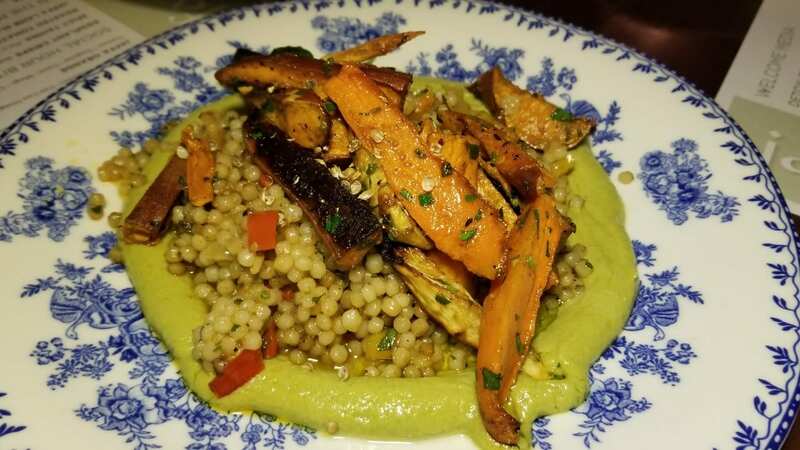 I also love the Market Couscous with roasted root vegetables, avocado hummus and harissa. The vegetables have a nice char on the outside and the dish is savory and comforting. 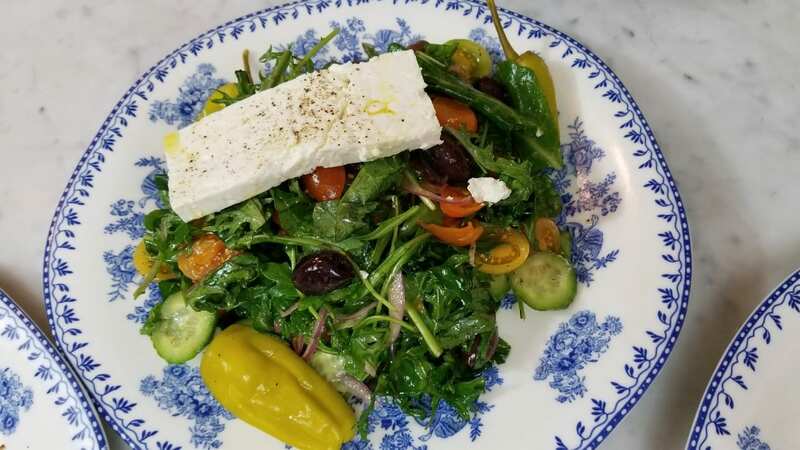 You can never go wrong with the fresh Greek Salad with olives, cucumber, local tomatoes, feta and oregano vinaigrette. 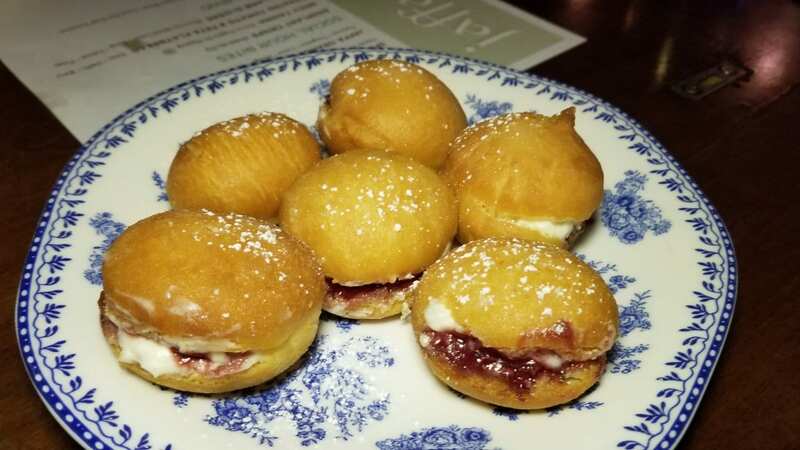 And to finish off a meal at Jaffa LA, little Jelly Donuts filled with sour cherry jam, cream cheese and powdered sugar are perfect little bites. Fresh ingredients, lots of flavor and a menu with one delicious item after another, it is no wonder that Jaffa LA is the Please The Palate pick of the week. 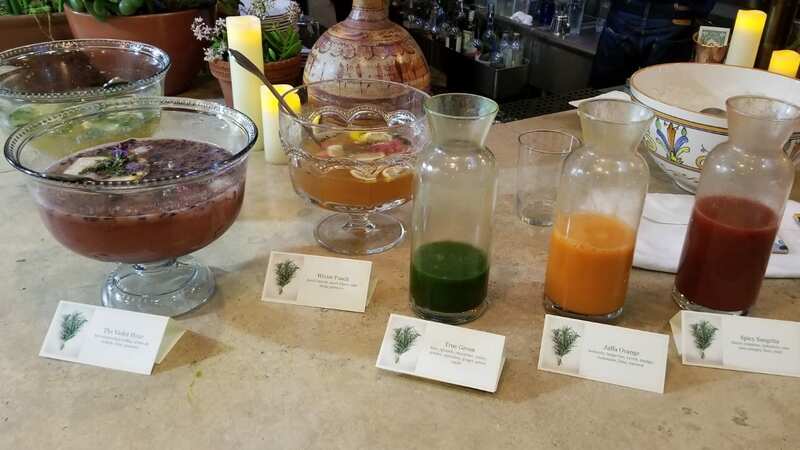 This entry was posted in Cocktails, Food and tagged food, Israeli cuisine, Jaffa.LA, pick of the week, Please The Palate, punch bowls by Allison Levine.